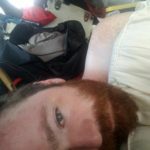 I had made some pretty crazy choices in the months leading up to getting the bus, but I knew that I hadn’t changed enough. It wasn’t enough to simply buy a bus, I had to take some sort of action to ensure that it wouldn’t just become another project that gets pushed to the side and never finished. If I wanted a home, I couldn’t stop pursuing it yet. So as October drew to a close and the end of the year drew near, I contemplated doing something a bit crazy again. Remember the girl I mentioned in the previous post? Well, while I was trying to change my own life, God had plans of his own. I had been a terrible boyfriend in a previous long term relationship, and when that relationship finally ended, I was pretty much resolved to go it alone from then on. I had held on for so long in hopes that I could make it work, that I could be different than I was, but it wasn’t until I finally burnt that relational bridge that I felt any peace about it. 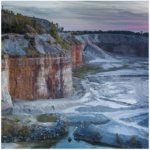 Once I had committed to a new way of life, little things in my life began to change. Addictions that had held me for decades fell away overnight. I still wasn’t happy, and I still wasn’t healthy, but I had finally been turned around and set on a new path. I resolved to be single, as I didn’t trust myself to be more than that. The girl in the previous post is now my fiance. God had his own plans. In November, we started going on dates. On December 14th, I started an account to save for a ring. On December 24th I asked her to officially be my girlfriend, and on December 28th I moved out of my apartment. 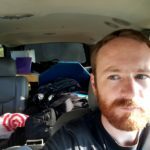 I moved into my truck. Somehow, I had felt that God was going to teach me something, and that he needed me to be homeless in order to accomplish it. So, more because it sounded like a great adventure than a desire to be obedient, I moved out of my apartment. I burned the bridge to the only place I had ever lived on my own. 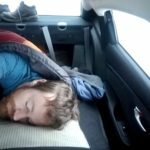 I spent the first few weeks in my cargo trailer with a propane heater and my 0 degree sleeping bag. After getting ice rained inside of it in a Menards parking lot a few weeks later, I chose to abandon the trailer and move into the truck. I showered every couple of days at a 24 hour gym, doing my best to avoid suspicion as I headed straight for the shower each time I got there. 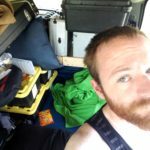 I ate far too much fast food in this past year, and I learned to stash snacks in my truck. I woke up many mornings in a new place, and occasionally didn’t remember where I was, or what I was doing there. I sweated through the heat of summer and shivered through the cold of winter. It is December 28th today. I’ve lived in my truck for over a year. I have learned so much. I now know more fully what a home is, and I am more convinced than ever that it has nothing to do with 4 walls, a shower, and a roof. Home is not a building. Home is not a place. Home is where you find peace. Home is where you go when everything else is falling apart and you are afraid that you’ll never find peace again. For me, home is where Samantha is. I’ve found in her someone who has accepted that I am more than a bit odd. She has accepted that sometimes I do crazy things. When I told her I was buying a bus on our very first date, and she didn’t refuse to return my messages, I knew that I had found someone special. When I told her that just days after we officially became boyfriend and girlfriend that I would be moving out, she accepted it and loved me in spite of it. I find more peace with her than I have found with any other person in my life. Home is not a place, it is the people in it. Your home can be church, school, work, or any number of other places if you find peace there. Now that a year has passed, I’ve given up my wandering ways, and I will be moving in to a rental home in a few weeks. I’ll live there in that house until Samantha comes to join me in roughly 4 months, and together we will make it a home. God has brought to me something I could not find on my own. Peace. Yeah…I slept in a Dodge Dart while my truck was at the shop. I often fought for room. I’m pretty disorganized…but I’ve had to develop at least a certain level of discipline. To everyone who knew my situation and offered me a place to stay, I am sooooo grateful for you. I appreciate everyone who offered me comfort, even if I didn’t accept it. To everyone I drove crazy by my choice, thank you for living through it, and just know that it wasn’t something you did that caused me to refuse your hospitality. I felt compelled to follow the call of God in my life. I’m sure that as time passes I will write more about this subject, as I do feel like I have learned quite a lot from it. Specifically, I’ve learned a lot about the cycle of poverty that can grab people in this situation, and how you really can’t just grab yourself by the bootstraps and pull yourself up. More on that later. Subscribe to the blog if you don’t want to risk missing these future posts. This entry was posted in 25 D.O.P. (2017) on December 28, 2017 by Joshua.